While studying fashion design at Parsons, I had a real eureka moment the day we were introduced to draping. I clued in that it was draped designs that spoke to me the most. Glamorous bias cut and draped fashions from the forties have always had a special allure for me. Draping became one of my favorite design techniques and still is today. As a curvy but petite 5’1” draped clothing gently hugs and flatters my curves without any boxy volume that can overwhelm my smaller frame. Regular sized draped pieces are also more forgiving on petite frames because the waist, bust and hipline are malleable vs. more structured designs that hit a petite frame at all the wrong points on the body. These are some of the stunning asymmetrically draped items that I’m coveting right now. Theory Dexas dress $755 USD, to buy click on this link. Rick Owens twisted jersey tunic $425 USD, to buy click on this link. DONNA KARAN wrap-effect stretch-jersey dress $2,006 USD, to buy click on this link. ISA ARFEN asymmetric top $585 USD, to buy click on this link. 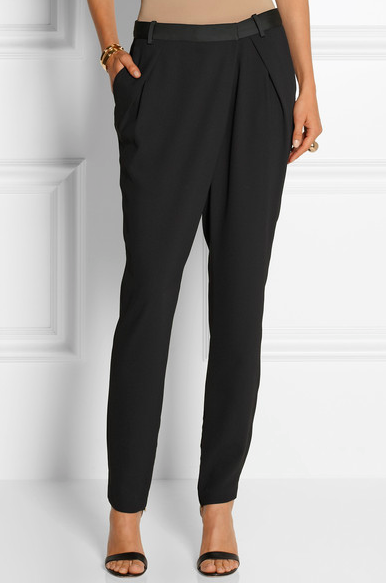 DAY BIRGER ET MIKKELSEN gabardine tapered pants $220 USD Click on link to by this item.